Vail’s Tess Johnson, 17, made her Olympic debut in women’s moguls Thursday night (Friday in Pyeongchang), skiing to a 22nd-place finish in the initial qualifying round on the Bokwang Phoenix Park course. Despite missing the top 10 and an automatic qualifying spot for Sunday’s final medal round, Johnson gets another shot in a second round of qualifying prior to the finals. “Sunday — here we come!!! You got this, @_tessjohnson,” Tess’s mom, Carol Johnson, posted on Facebook. France’s Perrine Laffont took the top spot with a score of 79.72, but three Americans joined her in the top 10 — Morgan Schild in third (77.74), Jaelin Kauf in fifth (77.45) and Keaton McCargo in eighth (75.67). Johnson, who attends the Vail Ski and Snowboard Academy, over-rotated on her top jump and had to pull off an awesome save to keep her run alive. She told Colorado Mountain News Media reporter Ed Stoner, formerly of the Vail Daily, that she had a lot of fun. 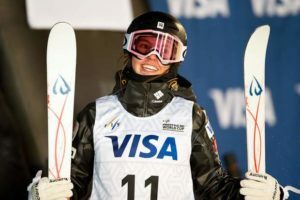 Johnson, a two-time state champion in soccer for Vail Mountain School, narrowly qualified for the Pyeongchang Winter Games with a fourth-place finish in the final World Cup event before the Olympics. Johnson’s score of 65.55 on Thursday was good for 22nd out of 30 competitors. The gritty competitor cannot be counted out in the next round of qualifying, having exorcised her initial butterflies at the Winter Games. Vail has a long history of quality mogul skiing, dating back to the professional mogul tour, where Kauf’s mother and father, Scott and Patti, regularly competed on their way to multiple titles. And Korean Olympic ambassador Toby Dawson, who grew up in Vail, won a bronze medal in men’s moguls at the 2006 Winter Olympics in Torino, Italy. For full results of Thursday’s qualifying, go to Olympics.org. For the start list for Sunday’s second qualifying round, click here.